Martindale-Hubbell is the facilitator of a peer review process that rates lawyers. Ratings reflect the confidential opinions of judges and lawyers who know the candidate being reviewed. Martindale-Hubbell Ratings fall into two categories – legal ability and general ethical standards. 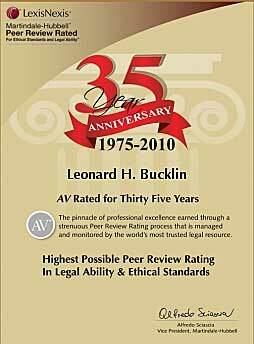 Leonard Bucklin has an AV© Preeminent™ rating. He has had an AV7copy; rating for over 35 years. Martindale-Hubbell representatives conduct personal interviews to discuss lawyers under review with other members of the Bar. A compilation of these opinions from various sources is necessary to form a consensus, and lawyers under review are sometimes asked to provide professional references to assist with the process. In addition, confidential questionnaires are sent to lawyers and judges in the same geographic location and/or area of practice as the lawyer being rated. Members of the Bar are instructed to assess their colleague’s legal ability and general ethical standards. Martindale-Hubbell’s service to the legal community is the Lawyer Rating system, which evaluates lawyers and law firms in the US based upon peer review. When making referrals or looking for counsel in another jurisdiction, lawyers need to have confidence in the individual under consideration. By reviewing the Ratings, they can select counsel with superior ethics, as well as the desired level of professional experience. Ratings attest to a lawyer’s legal ability and professional ethics, and reflect the confidential opinions of members of the Bar and Judiciary. The Ratings are part of a century-long tradition and are exclusive to Martindale-Hubbell. A lawyer can evaluate a colleague by considering the Rating, together with other data in the Professional Biography – such as practice areas, bar memberships, professional affiliations, education and clients. The Rating completes the professional profile, providing additional insight into who might be the right choice for that particular legal matter. Ratings are established by lawyers for lawyers; the people best suited to assess their peers are directly involved in the process.